The conference already took place. Please check back at a later date to find out more abut the next event. Extractables & Leachables testing for Glass? Glass materials used in packaging systems must be shown to be suitable for their intended applications. To address these issues, USP is currently revising its general chapters <660> Glass Containers Used in Pharmaceutical Packaging/Delivery Systems and <1660> Glass Containers Used in Pharmaceutical Packaging/ Delivery Systems: Manufacture and Evaluation of the Inner Surface Durability. Glass is not fully inert. Therefore, in addition to the glass surface tests, Extractables & Leachables have to be taken into account. Furthermore, in the last number of years, delamination (resulting in “Glass flakes”) and visible foreign particulate matter (i.e. glass particles), became the number one reason for glass related recalls in the pharmaceutical industry. Therefore the attention and demands of the authorities has increased, with a special focus on root cause investigation of the particle contamination. Compendial chapters have been changed and specified accordingly. FDA inspectors like to see the staged investigation cycle approach. Packaging materials also have to be described in the registration process of a drug product according to the particular requirements. The development of pharmaceutical packaging systems is an increasingly complex topic, which is reflected in the most recent requirements for combination products and biologics. To cover all relevant aspects a thorough target product profile needs to be set up. Furthermore, the pharmaceutical manufacturer has to guarantee that only such packaging materials are used that are correctly printed, in conformity with the specifications and in compliance with the regulatory requirements. In order to determine the scope of the tests for the quality control of pharmaceutical packaging materials, the “Defect Evaluation Lists” have proved efficient. The responsibility for the tests lies now more and more with the suppliers of packaging materials, while the pharmaceutical industry tries to reduce testing at the same time. Key issues surrounding USP’s and Ph.Eur.´s requirements for glass materials of construction for pharmaceutical packaging systems. Regulatory expectations regarding the suitability of glass components and systems used for pharmaceutical drug products. USP’s proposed revision to General Chapter <660>. 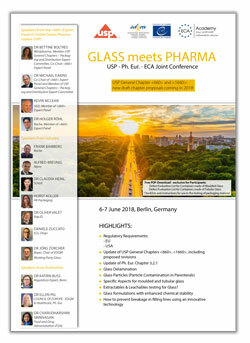 Conference presentations, case studies and open discussions will help participants learn more about the glass packaging materials and analytical procedures and provide a forum for discussing USP’s revised general chapters related to this topic. Participants will thus have the opportunity to give feedback and ask questions directly to USP’s Expert Panel Members. providing checklists and instructions for use in the testing of packaging material. >> Click on the Picture to download the complete Programme as a PDF. The USP, the EDQM and the ECA Academy wish to actively involve analytical chemists, QC analysts, quality assurance associates & managers, R&D scientists, as well as manufacturing scientists and managers, regulatory affairs specialists and contract laboratories / research organizations and suppliers.